Hello once again, boys and girls, and welcome to another episode of Chuggaconroy's Pikmin walkthr-wait. What I MEANT to say was, todays fun-filled topic is that of Sinnoh's mythology, and the Pokemon involved. 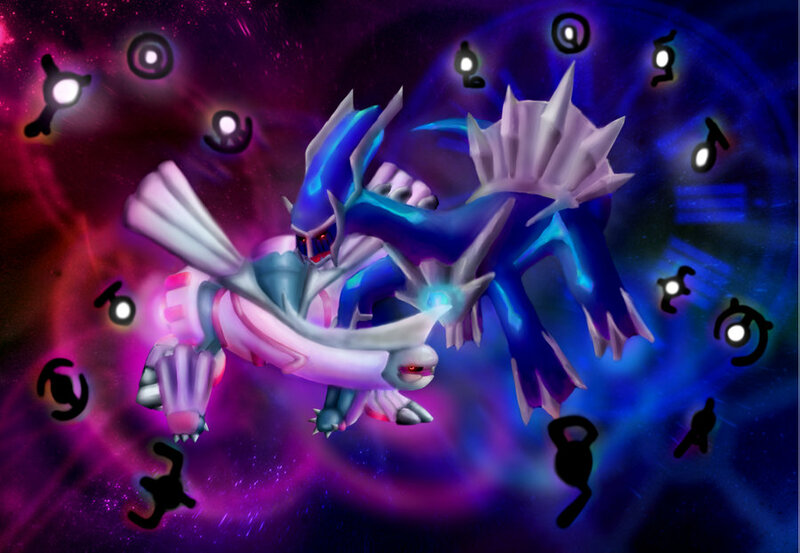 This involved several of Sinnoh's legendaries, most centrally Dialga, Palkia, Giratina and Arceus. Before we discuss the individual Pokemon, however, let's go over the general mythology of Sinnoh, Pokemon's creation story. In the beginning, there was a void of nothingness. Out of this void was spawned an egg, which eventually hatched into Arceus. Arceus was the one light in the darkness of the void, and the one thing that could create. It also held power over all that it could create. The greatest powers it held were those of time, space, and antimatter, the third of which comprised the void from which Arceus had been born. Arceus created three other beings that were omnipotent as Arceus was, and bestowed these powers upon them. These three Pokemon were Dialga, Palkia, and Giratina. As Dialga and Palkia set forth to work with Arceus in creating a world, Giratina showed violent, destructive behavior, possibly due to the nature of its power, and so was banished by Arceus into the distortion world. Arceus started creating the Pokemon world by building the region of Mt. Coronet, and then building the rest of Sinnoh around it. 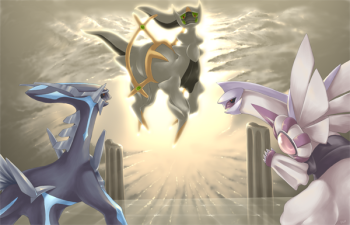 When humans were created, Arceus created three more legendary Pokemon; Uxie, Azelf, and Mesprit. These three Pokemon went down to the world with the purpose of giving humanity the gifts of wisdom, willpower, and emotion, respectively. Once their task was completed, and humanity had become a more intelligent species, the three Pokemon made their homes in Sinnoh's three lakes. Before retiring to the hall of origin, Arceus created the adamant, lustrous, and gresious orbs. These were left in Sinnoh for the sake of the existence of physical manifestations of the powers of time, space, and chaos. While we don't really know the reason for this, speculation isn't hard. The orbs may exist to maintain the time-space continium in the stead of Arceus and the other legendary Pokemon. Following this came some events in Floaroma town. The town and its meadow were a barren wasteland where nothing would grow. Many people tried to plant flowers, but they all withered and died. Then, one day someone expressed a prayer of gratitude for a miracle of nature, and the entirety of Floaroma burst into bloom. During this event, Shaymin was born. So now, let's go into the individual legendaries involved here. I'm excluding the trio of Uxie, Azelf and Mesprit because I've already touched on them in the legendary trios article. If you're interested, hit that one up. Dialga and Palkia are conceptually based on the Shinto myth of Izanami-no-Mikoto and Izanagi-no-Mikoto. This legend tells of two counterpart gods: Izanagi, the male, and Izanami, the female. The myriad gods asked the two to create a new land, Japan, out of the sea. They were given a spear, which was decorated with many jewls(hence Diamond and Pearl), and which they used to clear the water away from what would become an island. The two gods lived on this island, and built a palace with a large pillar inside(Similar to how spear pillar may have looked when first constructed). They married, and performed a ritual to bear children. These children would become the other 8 islands of Japan. Izanami died giving birth to the last of these, and Izanagi tried and failed to ressurect her from Yomi, the underworld. When he returned from the underworld, his body was withered, and performed a cleansing rite to heal himself. During this rite, three gods were spawned from him; Atamerasu teh sun god from his left eye, Tsukuyomi the moon god from his right eye, and Susanoo the god of storms from his nose. Izanami is known as the creation godess, having given birth to the eight islands of Japan, and so we can easily figure that Palkia is derived from her. Dialga and Izanagi, however, have much looser ties. Izanagi was not known as god of time or any equivelant, so Dialga's branding as time god probably comes from the concept of time and space. Physically, Dialga is based off sauropod dinosaurs, which include most four-legged dinosaurs, while its head holds striking resemblance to the xenomorphs, the alien creatures from the Alien movies. Palkia is based on the european dragon, specifically the Ljubljana, the dragon of Slovenia. Dialga and Palkia both have interesting secondary types, Steel and Water respectively. Dialga's steel typing comes from the encredible density of diamonds, one of the hardest substances on earth, while Palkia's water typing may come from the common association of water with life and creation. 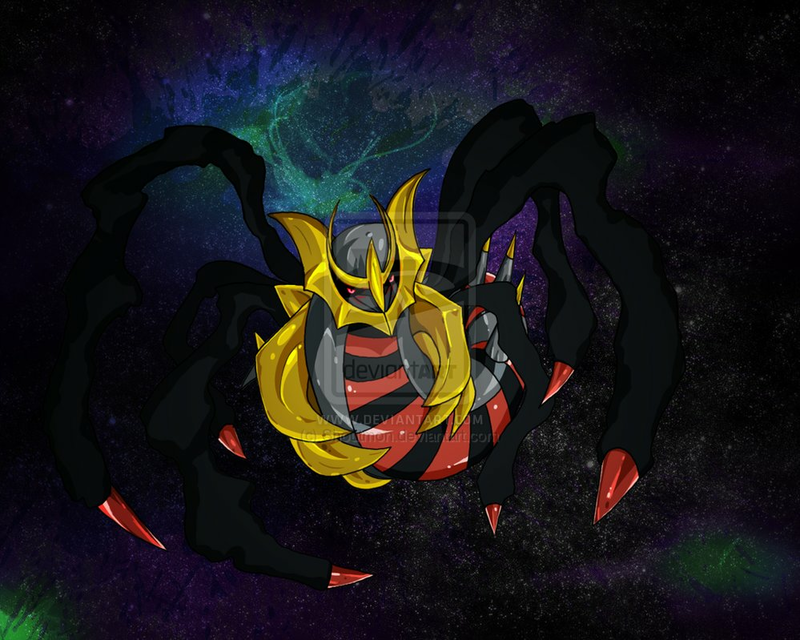 Giratina is classified as the renegade Pokemon. This is due, as mentioned above, to its voiolent behavior upon creation, which led to its confinement to the distortion world. As Giratina's powers are basically an inverse of those of Dialga and Palkia, Giratina's home is a place where time does not flow and space is unstable. Gravity works differently there, as made evident to anyone who's played Platinum. Giratina's origin form, shown here, is very snakelike, and often believed to be based on a Basilisk, a mythical European creature known as king of serpents, as well as a chinese dragon kite. Its altered form has a structure much like a cross between a Sauropod and some sort of insect, with wings akin to a bats. Shaymin is known as the gratitude Pokemon, due to the circumstances of its creation. In the anime, Shaymin and Giratina are linked through the story. Giratina wished to use Shaymins seed flare to open up a portal out of the distortion world. Shaymin flees, however, thinking that Giratina wants to eat it. 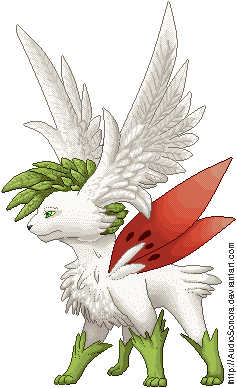 Shaymin has a naive and childish nature in its land form, but acts more maturely and courageously in its Sky form, which is activated when the Pokemon obtains a Gracedia flower. Shaymin is physically based on a hedgehog in its origin form. In this form, its body can grow flowers, similar to a chia pet, and when its back is in full bloom it resembles a full boquet of flowers. In sky form, Shaymin resembles a terrier or reindeer, with a more well-defined body and longer legs, plus antler-esque wings on its head. Shaymin sports the move Seed Flare, a signature move in which Shaymin takes in any pollution in air or water, breaks it down inside its body, and releases the purified substance in an explosive blast. Suprising power from such a little critter. Ah yes, Arceus. Creator of all in the Pokemon world. The concept of Arceus, based on those of Dialga and Palkia, most likely comes from that of two Shino gods; Kunitokotachi and Amenominakanushi. Kunitokotachi was described as one of two gods born from "something like a red reed that grew from the earth" when the world was still full of chaos, the first of three gods to be born during this period. Kunitokotachi is known in some sects as the primordial god of the universe. Amenominakanushi, meanwhile, is known as the first god to come into being in the plain of heaven as a "Solitary Kami", as opposed to a male-female Kami pair, and is another of the three Kami of creation. The two gods summoned Izinami and Izinagi to create Japan with theheavenly spear. Another possible influence on Arceus is a chinese mythical being called the Quilin, a dog-like creature often associated with prosperity and purity. The quilin was kind to the righteous and cruel to teh wicked. Its appearence would often signify the coming of a sage. One interesting note is that Arceus' creation myth is nearly identical to that of the Pangu, the chinese diety of creation. Both came from an egg spawned from a void of chaos, and both have primal appearences with animalistic forms. 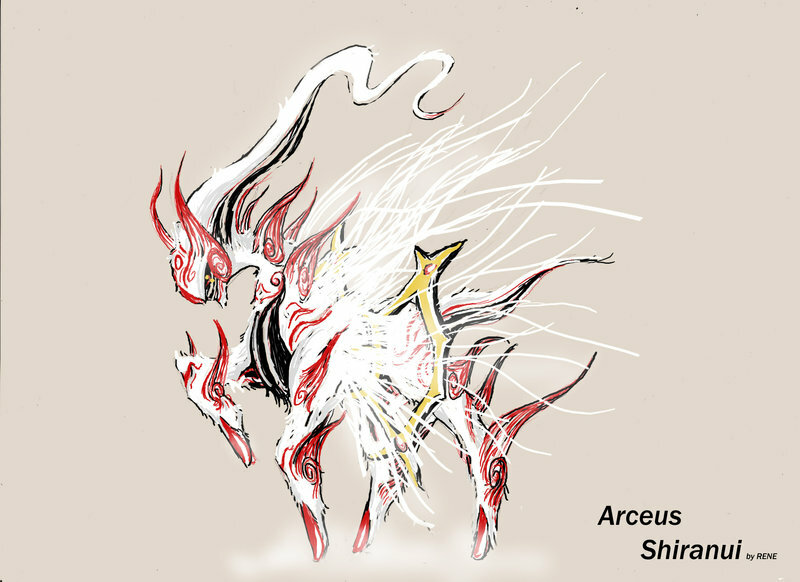 Speaking of its form, Arceus' physical design is that of one of the most wholly unique-looking Pokemon ever. It takes inspiration from horses, as evident by its physiology and movements(mainly in Battle Revolution), and a Centaur minus teh arms. It has a regal design, with a gold ring affixed to its waist that resembles a sunburst or blast of light. Arceus is one of the most wholly original legendary pokemon to date, and I love the thing to death. So there we have it. The Pokemon world is dense with myths in every shape and form, and we'll visit them again in due time.